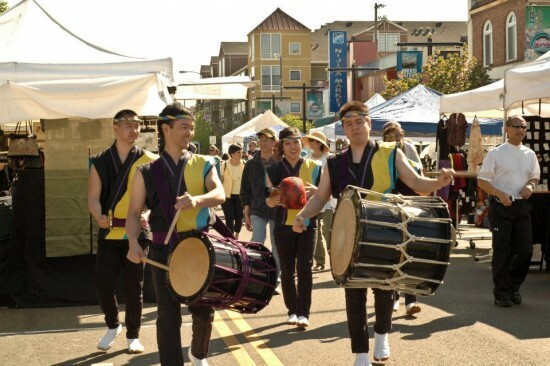 San Jose Taiko kicks off the festival on Jackson Street. SAN JOSE — Like cherry blossom festivals across the nation, the San Jose Japantown Nikkei Matsuri is the San Jose Japanese American community’s celebration of heritage and culture. This festival is enjoyed by people of all ages and is located in the heart of one of the three remaining Japantowns in the nation. 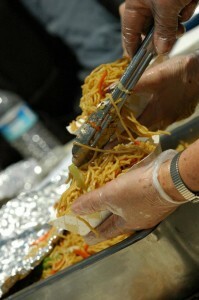 Yakisoba made by Wesley United Methodist Church. This is the 35th year of the festival, which continues to be vibrant and dynamic. San Jose Taiko begins the festival, set for Sunday, April 29, by beating the drums during a morning stroll through Japantown while volunteers prepare for a day-long celebration. Nikkei Matsuri (Japanese American Festival) was one of several ethnic community events in San Jose planned for the U.S. Bicentennial celebration. 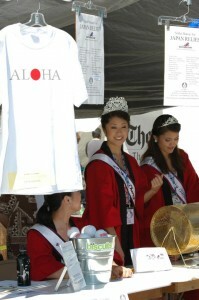 The festival was the Japanese American community’s way of sharing their culture with the city. This celebration was so successful that it has continued since then. The Nikkei Matsuri Committee, led by President Warren Hayashi, is composed of representatives of several non-profit organizations. Together, they coordinate a day of foods, performing arts, cultural exhibits and arts and crafts with the goal of sharing and celebrating Japanese American culture in the heart of San Jose ’s Japantown. Board members and coordinators of the festival include Jimi Yamaichi, Norman Tanaka, Larry Kaneshiro, Victor Imahara, Pam Yoshida, Sharon Siegenthaler, Kathy Linderman, Frank Tao, Vi Onishi, Ruby Kobashi and Gordon Koo. Participating organizations include San Jose Buddhist Church (Cub Scouts, Boy Scouts, Japanese Language School and Buddhist Women’s Association); Wesley United Methodist Church (Youth Group and church); San Jose JACL; San Jose-Okayama Sister City Organization Inc.; YJA (Young Japanese Americans); San Jose Buddhist Judo Club; Northern California Kendo Federation; West Valley JACL; Silicon Valley JACL; and the newly formed Japantown Lions Club. The food booths feature such Japanese-themed delicacies as gyoza, inari sushi, ika fry, yaki soba, tempura, udon, manju and chicken teriyaki. “Non-traditional” Japanese items include teriyaki burgers, Chinese chicken salad, snow cones, ice cream, Nikkei Dogs, Spam musubi and strawberry shortcake. Indoor Stage — Ensohza (traditional Japanese folk music), Marimo-Kai (koto), students of Madame Hanayagi Michiya and Madame Bando Misayasu (Japanese classical dance), Aikido of Japantown, and San Jose Buddhist Judo Club. 2011 Northern California Cherry Blossom Queen Jeddie Kawahatsu and her court helped raise funds for earthquake/tsunami relief efforts in Japan. Outdoor Stage — CYS (Community Youth Services) Dance Group, students of Ukulele Jams, Chidori Band (traditional Japanese music), Wesley Jazz Ensemble, and San Jose Taiko. Cultural displays in the San Jose Buddhist Church gymnasium include: Two styles of ikebana, Sogetsu and Ikenobo; displays by the San Jose Bonsai Club; calligraphy from Beikoku Shodo Kenkyu Kai; and handcrafted kimekomi dolls by Mataro Miyabi Kai, Northern California Shibu. A highlight of Nikkei Matsuri is unique arts and crafts by vendors from throughout the western U.S. and Hawaii . Over 60 booths will line Jackson Street. All items are handcrafted and use Japanese traditional designs, materials and form in a contemporary art or craft. One might find soap in the shape of sushi, or clothing made of shibori or kimono fabrics. * Japanese American Museum of San Jose will host a Kodomo no Hi (Children’s Day) celebration with activities for kids. Nikkei Matsuri will be held from 9:30 a.m. to 4 p.m. with all activities taking place in on or near Jackson Street between 4th and 6th streets. Admission is free. 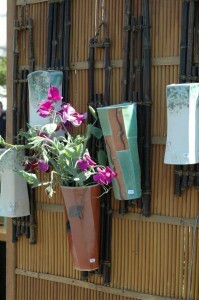 For more information, call Warren Hayashi at (408) 241-0900 or visit www.nikkeimatsuri.org. The Mercury News is a proud sponsor of Nikkei Matsuri, which is also made possible by the support of Union Bank and Nikkei West newspaper.